4. committed by the accused or some accomplice with him or her in an attempt to commit, or during or immediately after the commission of, an offence punishable by at least 25 years imprisonment (constructive murder). Would that be something like kidnapping someone for ransom, but then the person accidentally dying in your custody? In the light of the AFP failing to discover any wrongdoing, this quote from de Garis in Court today is interesting. I think considering the minister is going to be an LNP Minister at least 50% of the time and we have seen six years of corrupt evil LNP Ministers giving the minister any power doesn’t work. Labor is doing badly when it’s to the right of a Tory of Wentworth. I think it is fair to say Labor has avoided the Liberal side of the wedge. My argument is the Green’s side is ineffective because the Greens have shown themselves to be pure; but will get nothing. You vote green when you mad but not mad enough to want to change things. If you want to change things you vote for the other party that can form government. The party the gives little value to “signals”, but big value on getting to a position to where their policies matter. Thanks! I don’t agree with giving the Minister extra powers (isn’t there enough ministerial oversight already? ), but the other changes seem reasonable enough. Banks, the Indi woman and Bandt show the limits of relying on the the independents to achieve anything. Sounds like he’s pleading the fifth amendment. Can you do that in Australia? Greg Sheridan likes Labor’s amendments. A Dr. not so much. Fess we don’t know the substance yet so it’s hard to reach a final view on Labor’s position. My gut tells me Shorten will again pull off a reverse wedge and leave the Coalition hanging like a shag on a rock. True, if you want to achieve anything that is. The Dr is pointing out 800 people have been moved from the camps with no impact on the “pull” factor. Wilson in a spot of bother with the law? Steve Price and Rita Pahahi very gung ho about Morrison’s speech at the NPC and salivating at the prospect of the government stampeding back into power on the back of Labor’s alleged weakness on border protection. Good luck with that. Price just said though that he thinks Shorten will be too smart to be tripped up over the Phelps bill; and I agree with him on that. He might get a reverse Liberal wedge with a green one tacked on as well. As long as the outcome is that people who need medical support are able to receive it. Morrison isn’t anywhere near the opponent Turnbull was, and Turnbull was pretty hopeless really. I don’t expect the govt to come out of this a winner – based on the shouty interviews from yesterday they already appear hysterical and dishevelled which is probably in and of itself telling. 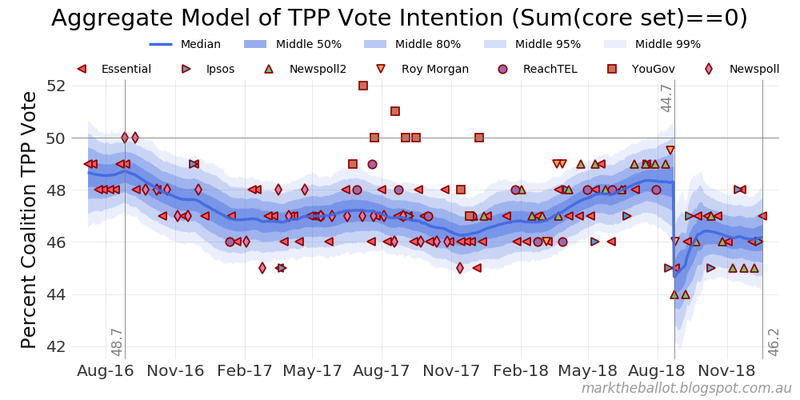 “Following the change of Liberal Party leadership – from Turnbull to Morrison – I introduced a discontinuity into the model, which allows for a substantial single-day change in voter sentiment. Today, I further tweaked the model so that it estimates and reports on the size of the discontinuity. Watch Lang Hancock explaining why using those ‘clean’ atom bombs for mining is you beaut. Heck ‘colour tv’ is more dangerous…………………….apparently. For a real shock watch the Lang clip after this one. From reports today, Wilson has been told to resign by his own sides. But, Morrison is saying no! Will get ugly. You can refuse to answer a question on basis of self-incrimination grounds and then an elaborate process is gone through where a certificate is issued which only prevents the incriminating evidence being used in subsequent criminal proceedings. Normally the witness then answers the question with the benefit of the certificate. Under the Uniform Evidence Act, he can ask for a certificate that gives him a qualified* immunity that the evidence he gives can’t be used as evidence against him in seperate proceedings. After that certificate is issued he can be compelled to answer the question. *the immunity does not apply if his answers then given under oath are perjury. Could one of the people on that petition list sue? The short answer is that on the day, the change cost the Coalition three percentage points in TPP vote share. There’s your primary election issue. From Amy at the Guardian. So those changes Labor wanted are endorsed, but a caucus sub-committee will look at the final wording of any deal with the crossbench. One of the sticking points – the change from 24 hours (for a minister to sign off on or reject a transfer request) to ‘as soon as practically able’ – there are some who still want a figure put on it. Fess Turnbull is smart but lacks the political smarts that Shorten is excellent at. Morrison is struggling in the Third Division and can’t score a goal against Shorten. We have to hope Shorten can transition the political smarts into good government. Heaven knows we need that. But the philanthropic Fairfax family ethos shone through their newspapers and will be long remembered. If we haven’t already done so, we should immediately support quality journalism through Crikey, now with Fairfax family backing for its new investigative unit. It wouldn’t surprise me if the letter to the Thais a few days ago by the 2 diver doctors who were so important in the cave rescue of the soccer kids had substantial influence on the release decision. But, the info atm is the Bahrani’s dropped the extradition request. So, there is more to this than has been revealed. I’d say you are right about that. How can he incriminate himself as he can’t be the one who told himself of the raid. By the way, I still think your comment supra was a hoot. I heard about the Labor flyer highlighting Nicole Flint’s ‘hand that signed the paper’ against Turnbull. Driving past Michael Sukkar’s electoral office today I was thinking a similar flyer on him would be excellent. 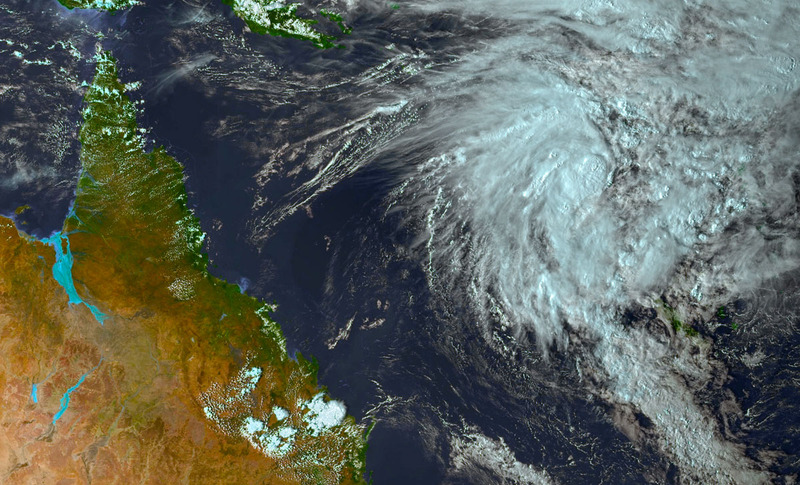 Colour-enhanced satellite image showing the flood waters south of the Gulf of Carpentaria. Sceptic the person who told him may have made him passing on the information a breach of the law. I am sorry to hear your day has not been good, but yes, this is great news. I feared Hakeem would be there for months. What a miserable honeymoon for him and his wife. I still want to know if Dutton had anything to do with him being detained by the Thais. Perhaps once the person is named other stuff will come out where he has been a ‘naughty widdle boy” ? He would make a better Foreign Minister than the one we’ve got. She is useless at this stuff. De Garis smells a lot like that weasel Ashby and his ‘work’ with Brough and Co during Slippergate. It is good to see the Union via the court is applying some heat to the protected ones. FDotM , an excellent name for Timmeh! Poor ladies designer borzoi Faberge caught a chill. Oooooh! Cousin Graspy the finance goblin from Graspcorp! Where have I heard that before? 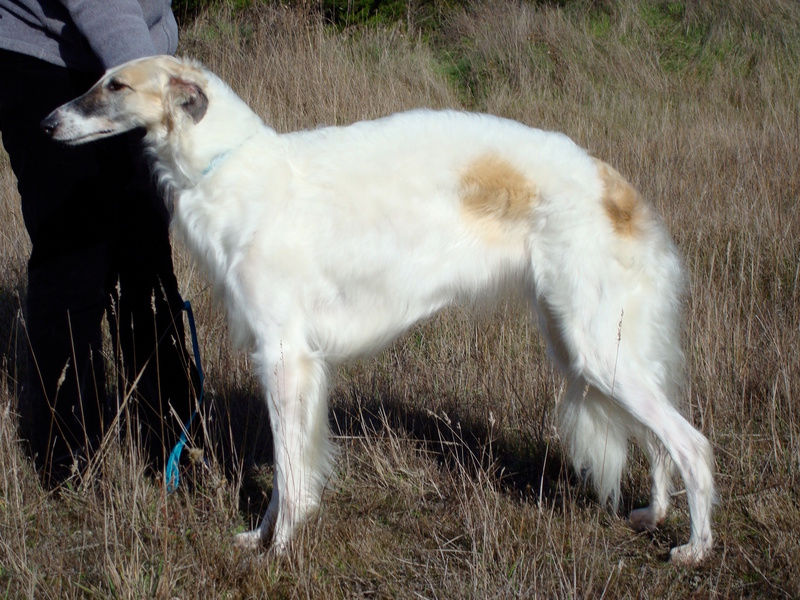 PS I knew a designer Borzoi once. It caught a Porsche and expired from the consequent ennui. The word block has gone. That was useful. With that feature I could block replies as to nuisance commenters as well. Pedant, i can assure you that had Foster, the Australian Football Federation, Pascoe Vale Football Club and a range of international stars not initiated a ruckus, he would already be in Bahrain by now. My read is that he got the information through not exactly legit means. Spot on. A good post. De Garis strikes me as one of those people that don’t want to say anything in case they say something! Puffy, no person of normal intelligence wants to hear about who you block or how you block them. STFU about it, now and always. He was in the office that was lawfully told of the raid, difficult to see a crime there. Otherwise it is a valid defense in all cases even when one is innocent or not involved. Mavis demonstrates what I meant by “ancient grudges”. Mavis, you’ve outed yourself. Thank you. For myself, I’d forgotten all about it.